Peter D. Burchard, "George Washington Carver: For His Time and Ours," National Parks Service: George Washington Carver National Monument. 2006. Barry Mackintosh, "George Washington Carver and the Peanut: New Light on a Much-loved Myth," American Heritage 28(5): 66-73, 1977. Louis R. Harlan, Ed., The Booker T. Washington Papers, Volume 4, pp. 127-128. Chicago: University of Illinois Press. 1975. 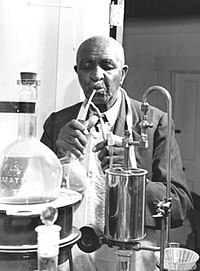 George Washington Carver. "How to Grow the Peanut and 105 Ways of Preparing it for Human Consumption," Tuskegee Institute Experimental Station Bulletin 31, 1916. George Washington Carver. "How the Farmer Can Save His Sweet Potatoes and Ways of Preparing Them for the Table," Tuskegee Institute Experimental Station Bulletin 38, 1936. George Washington Carver. "How to Grow the Tomato and 115 Ways to Prepare it for the Table" Tuskegee Institute Experimental Station Bulletin 36, 1936.